← 2105 Surf Season Begins! 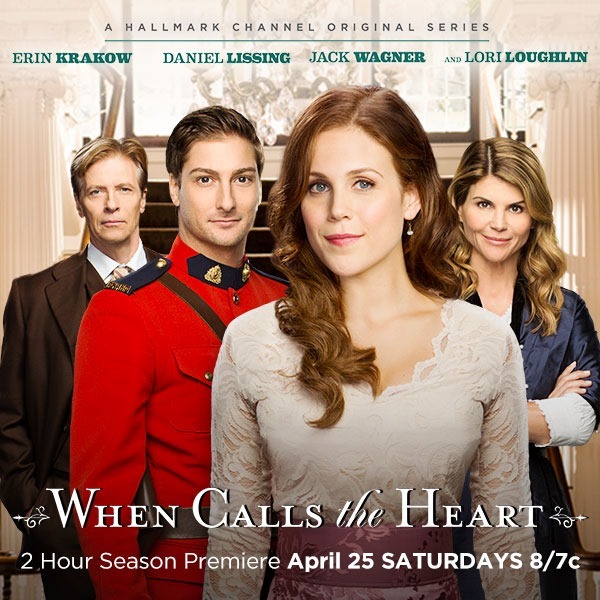 Giveaway–DVD–When Calls the Heart–New Episode April 25th! Speaking of Don’t Tell Them – my biggest order for this review is to NOT give any Spoilers for Season 2. I was able to watch the two hour season opening online that will air on Hallmark on April 25th, 2015. Can I say WOW. Am I allowed to say Change is Afoot? One thing that struck me was the upgrade to the entire production in Season 2. Season 1 was pretty fantastic. Part of the story is that it is a small mining town – now inhabited by poor widows whose husbands were killed in a mining accident. It flows with their need to earn monies, keep their homes, hire a school teacher, and have class /church/gatherings in the only building in town – a saloon. It is the wild Canadian west – so our trusty Mounty arrives to help solve problems. In Season 1 – the thread of relationships are formed, the hints of romance are revealed, the struggles of the wives and their children are fought – and speaking of fighting – of course there is a powerful enemy in town that has the money and goons to get away with whatever he pleases – while keeping his hands clean in front of the law. Upgrade? Yes, I have been watching quite a few Masterpiece Theater shows lately, this season 2 felt more like their products. Sets, varied sets (no spoilers) and costumes. The film crew really did a great job as well. Although we love Season 1, I’m assuming they got a huge budget increase to film Season 2. I don’t have cable, so I’m going to need to figure out how to watch Hallmark on line . . . . Cliff Hanger Again! with the Season Premiere of Season 2. OH HOW I WISH this could be a blog post about what I think will happen, to those people, at that place, when they found out – or what I think I know – or how I feel about that um . . . GRRRRRR. Just figure out how to watch it on Hallmark on April 25th, then we can talk. Share my post on FB for a third entry! Congratulations to Ellen P. !! Random Number Generator Picked your Entry!!! 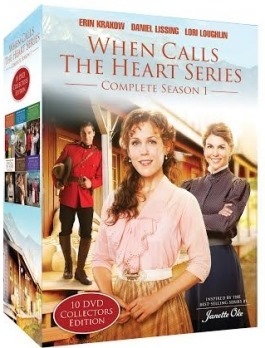 1 set of When Calls The Heart Season 1 on DVD ($60 value!) Thank You Word Films! IT’S VERY IMPORTANT THAT YOUR POSTS DO NOT INCLUDE SPOILERS – That was from the boss – but Man o Man – I wish I could chat it up!!! The series is inspired by Janette Oke’s bestselling book series about the Canadian West. “When Calls the Heart” tells the captivating story of Elizabeth Thatcher (Erin Krakow), a young teacher accustomed to her high society life, who receives her first classroom assignment in Coal Valley, a small coalmining town where life is simple, but often fraught with challenges. Lori Loughlin plays Abigail Stanton, a wife and mother whose husband, the foreman of the mine, along with a dozen other miners, has just been killed in an explosion. The newly widowed women find their faith is tested when they must go to work in the mines to keep a roof over their heads. Elizabeth charms most everyone in Coal Valley, except Constable Jack Thornton (Daniel Lissing) who believes Thatcher’s wealthy father has doomed the lawman’s career by insisting he be assigned in town to protect the shipping magnate’s daughter. Living in a turn of the century coal town, Elizabeth will have to learn the ways of the frontier if she wishes to thrive in the rural west on her own. This entry was posted in Movies, Reviews and tagged FaithTV, Giveaway, Hearties, HS Blogger, When Calls the Heart. Bookmark the permalink. 11 Responses to Giveaway–DVD–When Calls the Heart–New Episode April 25th! I know I would lI’ve this series!! 🙂 Thanks for the opportunity! My four girls and I love Janette Oke’s stories! Can’t wait to see this! I haven’t seen it but it looks like something I would like. I haven’t seen this yet, but it looks like a show my mother and I would love! I have read Janette Oke’s books before and I’m a fan so I’m sure I would love this series. This looks like a great series. Can’t wait to see it. I just heard of this series I can’t wait to watch with my girls. I love this series! What a great giveaway! We cut off our cable mid season last year, so I’d love to win this. Thanks for this great opportunity to win such a great series. I don’t have the Hallmark channel, but was visiting my grandparents and saw a preview for the show. It looked so good that I came home and watched it online. I hope to be able to watch the rest of the shows soon! Sounds like a great series!! I miss Hallmark shows. I would love to be entered to win. Thanks for the giveaway.